Use our Palms Casino Resort discount to score a nice, cheap rate, a free upgrade to a Premier Room AND two free passes to Ghost Bar. Ghost Bar has THE BEST view of the Las Vegas Strip! Free room upgrade is based on availability. The Palms is located west of The Strip on Flamingo Road. If you are worried about being too far from the action, don’t be! The Palms offers a free shuttle to and from The Strip every half hour from 11AM to 8PM. It lets you off at the heart of The Strip, at The Forum Shops at Caesars Palace. Also, The Palms is a cool destination unto itself! The Pearl is a great concert venue (Coupon Puppet saw Ringo Starr there- 10th row!!! ), NOVE Italiano is regularly voted the Best Italian Restaurant in Las Vegas and Ghost Bar has the best view of the Las Vegas Strip! The Palms even has its own IMAX movie theater, if you’d like a cool, dark place to hide in during the day. Our only complaint about The Palms is the beer selection but hey, nobody’s perfect! There are three towers with guest rooms at the Palms Casino Resort: Fantasy Tower, Ivory Tower and Palms Place. Fantasy Tower has “superior” guest rooms, along with all the crazy rock-and-roll suites you have seen in music videos. Ivory Tower has the newly remodeled “premier” rooms. Palms Place is the quietest tower with condo-like suites and its own pool. 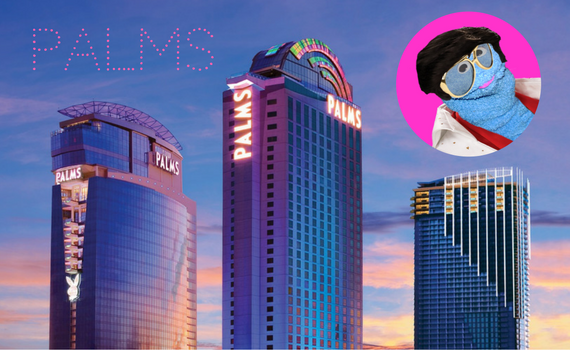 You Can Always Find A Palms Casino Resort Discount Here At Coupon Puppet. Staying At The Palms? Why Not Catch A Show Across The Street At The Rio?